What Mom doesn’t deserve a sweet retreat? 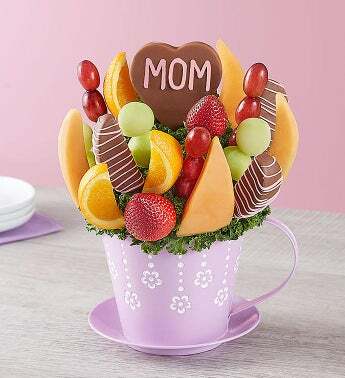 We’re serving up a delightful teacup filled with refreshing fruit, featuring a dipped and drizzled heart-shaped pineapple, decorated in pink just for her. Our lavender tin teacup, adorned with a delicate floral pattern, can be later used as a decorative planter or for storing kitchen tools. Make her day even more special by adding a festive Happy Mother’s Day balloon to her gift!